If you have some valuable items, such as important documents and possessions at work or at home than you need a safe which will protect them against theft or damages. Security safe boxes were very in demand in the past and now with not stable economy they become even more popular. Most of them are not only strong and durable, but also provide some peace of mind to their owners. There are lots of security and safety products available on the market now. Many safe manufacturers now offer from small and affordable safes boxes to large and expensive ones. They are vary in shapes and sizes and even have some specific functionalities. For example, jewelry safes are burglary and fire safe boxes which typically manufactured with interior jewelry chests and some other organizational configurations. In addition, it is not only fire and burglary safes are available on the market, but keyless door locks, exit alarms, and key cabinets. Having a safe for guns is an essential not only for preventing it from stealing, but it is important in term of keeping it away from children. Specifications for security safe boxes include parameters, such as resistance to theft and fire, type of lock (combination, key, time lock, electronic locking), and location (wall or floor safes). A fire-resistant safe protects most of important documents and valuable things that inside of it from high temperatures or actual fire. Whether these contents survive a fire depends on the length of exposure and the surrounding temperature of the blaze. Those safes are usually rated by the amount of time they can withstand the very high heats, while not exceeding certain internal temperature. For example, inside temperature should be less than 350 °F (177 °C) over 30 minutes. You can find on the market security safe box models that can stand the exposure somewhere between 30 min to 4 hours’ durations. The higher the withstanding ability and more features a save box has, the higher the price for that will be. In addition, you should keep in mind that fire-resistant safe boxes are not equally suited to the protection of all valuable items that you may have. For instance, your important paper documents need relatively the least protection and might not be damaged by internal temperatures of 350 °F (177 °C). However, some vulnerable items, such as CDs, DVDs, video cassettes, film negatives, and floppy discs will survive at temperatures up to only 125 °F (52 °C). 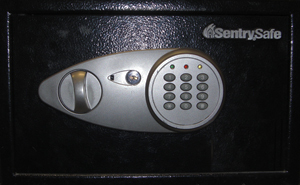 It is impossible to put the price on safety and if you are buying a safe for extremely valuable stuff than cost of a home save box shouldn’t be a prior concern, but its usability and security qualities are. If the items won’t be priceless homeowners might consider buying some inexpensive safe boxes which only can insulate the items within for a certain period of time. Therefore locating the fire safe boxes in areas where the best protection and the least exposure can give you a better safety. For example, on a lower floor or in a basement, the safe would not be subject to the full intensity of the blaze. An in-floor safe installed in a concrete floor is more resistant to a fire than those in other places. While shopping for a security safe box you should read a product description very carefully because not all floor safes are water resistant and might fill with water from fire hoses. However, a typical safe warranty provides for replacement of the box itself if defective but does not insure the contents against fire or water damages.